Stock #A112:IMMACULATE!!! Antique Estate Style Woven Prong / Lucern Engraved Solitaire ring.14K WHITE GOLD.... 1 Carat RUSSIAN Cubic Zirconia. Gorgeous hand-made piece!!! Beautiful, Hand-Crafted, top quality Jewelry workmanship!!! Heavy ring, shank, & prongs. 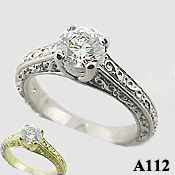 matching band A112B make a Beautiful Wedding Set! Available in 14k White Gold or 14k Yellow Gold.